I think we will finally be able to send out these blog entries. I am writing this at anchor in ‘The Flats’ in Colon, Panama. We are waiting for someone to come to measure us to determine how much our toll is to transit the Canal. After that we need to pay for the toll (along with a buffer fee in case we break the Canal or slow it down). This will be $1600 in total and we should get half back at some point. After payment we can talk to the Scheduler to find out when we can go through to the Pacific. 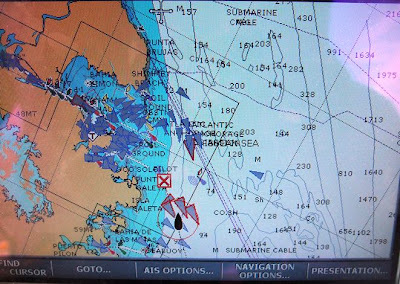 This is our chartplotter as we approached Colon, Panama. We are the little black boat at the bottom, all of the triangles are ships. The Canal is at the top left. It really is a busy place. Back to where we left off with the last entry, in Kuna Yala. While we were there we experienced the heaviest rains ever recorded in Panama – which is saying something since this is a rain forest. Over a period of nine days (two of which were sunny), we had something like 25 to 30 inches of rain. There was so much rain that the Canal was closed for a day – only the third time it has been closed since it opened for business in 1914 (landslide in the '20s and the US invasion a number of years ago). Unfortunately quite a few people were killed in the flooding and by landslides in various places. Three sailboats and a freighter were also lost in this time. We were perfectly safe in one of the most secure anchorages in the area at a large town (3000) called Nargana. There was not very much to do and supplies of vegetables ran out in the tiny stores. Also the boat was incredibly damp and everyone was complaining on the morning radio net about new leaks in their boat. Things to do when it rains for a week or more. June sewed courtesy flags for the Pacific. This one is the Cook Islands. 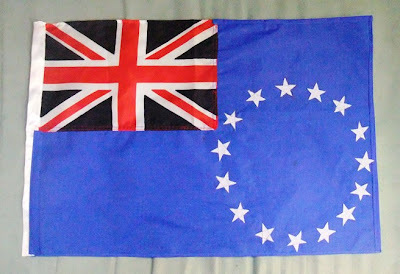 It started life as a British red ensign. The rest of the red ensign became part of the flag of Tonga. We have a source of really cheap courtesy flags ($US 2) but they do not have all the small countries. While we were in Nargana the big news was a drug bust. There are many itinerant trading boats that pass through KY buying coconuts (25 cents each) from the Indians and bringing in all the stuff sold in the stores. One of these was found with 900 kg of cocaine on board. Perhaps the find was related to the fact that the army had 300 soldiers in town for training exercises. The soldiers were all over town enjoying the good life (better than patrolling the Panama-Colombia border – one month on and one month off) but always had their weapons with them ranging from rifles to a variety of machine guns. This is the cocaine boat. It is typical of the Colombian trading vessels in KY. The soldiers are unloading flour, rice and other things that were used to hide the coke. 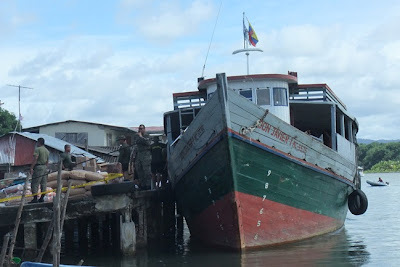 These trade goods were distributed in Nargana - seems like a good way to get a tip about the next cocaine boat. - We explored the Rio Diablo by dinghy before the rains started. That was a fun morning. The Kunas have farm plots along the river in the jungle where they grow coconuts, bananas, and I assume low plants that we could not see from the boat. There also were small cemetery sites along the water. This makes sense since there is no land to waste on the residential islands. We towed one gentleman upstream since paddling one of these dugout canoes is pretty slow. There was tremendous erosion along the river during the rains as the entire bay turned a red-brown colour. I assume some people lost parts of their ‘farms’ as they were right next to the water in most cases. - We bought a mola from the most famous of the mola makers –Lisa Harris (btw, that name is not at all Kuna in origin – I suspect it came from a book or a movie). Lisa is not only famous for her molas; she is also the most prominent Kuna transvestite. Transvestites are apparently common and not looked down upon in this matriarchal culture. She dressed well and had good makeup and hairstyle, but hands like a stevedore. 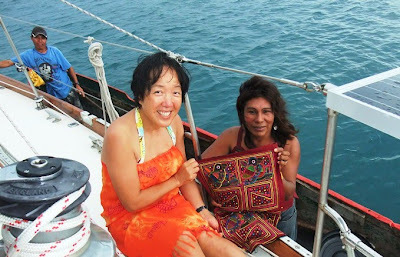 -JJune and master mola maker, Lisa, with the mola we bought. June is on the left. una are the second smallest group of people in the world after the Pygmies. Men are often around 5 feet or a little more and women are often less than 5 feet. Their two most popular games are basketball and volleyball in a country were baseball and soccer are king but there just is not enough room for these sports on their little islands. We met a delightful 74 year old named Sammy who went to college in Oklahoma to play basketball and later was on the Panamanian national basketball team. He was about 5’4” so I suspect not a power forward. - Had a strange experience on a remote island. A family paddled up in their dugout canoe and asked if we could charge their two cell phones. The cell coverage is very good but only a few of the larger islands have electricity. Next time, Colon, the Canal, and Panama City. Posted by Bruce at 3:27 p.m.
December 28, 2010 at 11:32 a.m.
January 22, 2011 at 8:36 a.m.
Nice to see you two underway again, Bruce and June. I look forward to further reports. I've bought a new engine and things are proceeding apace here. January 30, 2011 at 8:12 p.m.